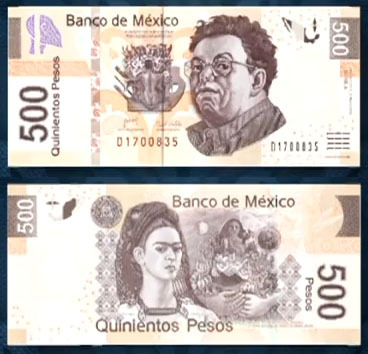 Two of Mexico’s most treasured artists, Diego Rivera and Frida Kahlo have been joined the ranks of an Aztec lord, a military general, and cherished poet/nun, a hero of the Mexican war for Independence, and a revolutionary hero as the newest faces on Mexican currency. The portraits of these two artists are now featured on the new 500 Peso Bill. Can you name the historical Mexican figures alluded to above and on which bill they appear? Post answers in the comments! they took off “el general” Ignacio Zaragoza for this fat painter. Shame shame!! !